Wylie helped build what he describes as “[Trump advisor] Steve Bannon’s psychological warfare mindf–k tool,” which exploited Cambridge Analytica’s haul of Facebook data. But this was not the reason he was targeted. The Canadian went on to become a vocal critic of the UK’s Brexit referendum, challenging the validity of the vote. In March, Wylie said the UK may not have voted to quit the EU if it had not been for “cheating” by the Leave campaign. Neil P. Mockford/Getty ImagesChristopher Wylie. His “unique” look, as he describes it, was actually discussed prior to the story going live. He thought about stripping the pink from his hair and removing his piercings, but decided that his identity as a gay man should be part of his narrative. His evidence thrust Facebook into a tsunami of scandal, wiping $US60 billion off the company’s value and forcing CEO Mark Zuckerberg into a media apology tour, which has evolved into a global advertising campaign. 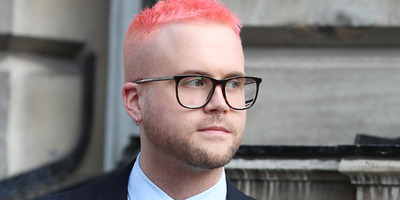 Wylie is comfortable with Cadwalladr’s moniker, particularly as he hopes to inspire a new generation of whistleblowers to come forward and expose corruption. “It’s important that people see that you can be a whistleblower and you can be different,” he explained. Born in Victoria, Canada, Wylie now lives in London. He is coy about how he earns a living but said he does consulting work for “different authorities in different jurisdictions” to help them identify blind spots on emerging technologies.